With the LP-10 from TVS we offer you a professional 26.4 cm 10.4 LCD display with high performance in presentation and ergonomics. The small dimensions of only 251x229x99 mm WxHxD and its light weight of 1.1 kg predestine it for any application, especially in cramped work places. The LP-10 shines with top-performance in handling and presentation a resolution of 800x600 pixels, contrast rate of 4001 and 250 cd/m2 brightness make it an all-rounder at the POS, in production and in the office. The reaction time of 6/19 ms spares users eyes, while the viewing angle of 130 778 increases their efficiency. 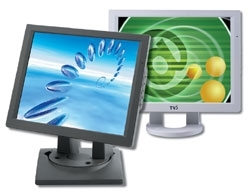 Setting the monitor is also particularly easy using the i-touch auto-scaling function, even without calibration experience the user simply presses this functions button and leaves the adjustment to the device. The control elements placed on the side of the device prevent unintended changes in the configuration. Through the minimal housing depth 33 mm and its flat design it is perfectly placed in elegant shops and boutiques. The massive stand ensures stability in all surroundings. Diverse set-up options such as swivable desktop mounting or the rear-sided VESA mounting provide the necessary flexibility to professionally react to the different requirements of you. Trendy versions in white and black round out the overall look. Optionally you also get the 26.4 cm 10.4 monitor from TVS with an especially robust and scratch-proof, all-glass surface. This non-reflecting model gives you additional security for use in industrial surroundings and kiosk applications. We also offer the LP-10 with an integrated Fujitsu touch screen. You directly operate the application via resistive touch technology and can completely go without additional entry devices.